Holiday Greetings from our Little House to yours! As you all know, I have not written but a few blogs for several weeks now. 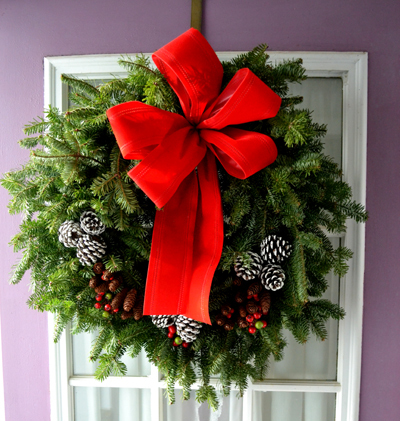 Besides the holiday craft shows, we have been very busy here at Little House. My oldest daughter has moved and moved and moved!! Though we knew that she had a house full of stuff all packed into Little House right along with all of our belongings, we were amazed at just how much she managed to pack into her rooms and spaces. 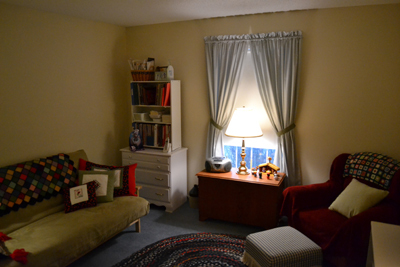 We have been very busy turning her rooms back into "functional" living spaces! 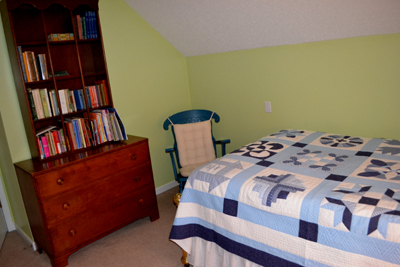 Her downstairs room was turned into a "play den", and a second guest room. 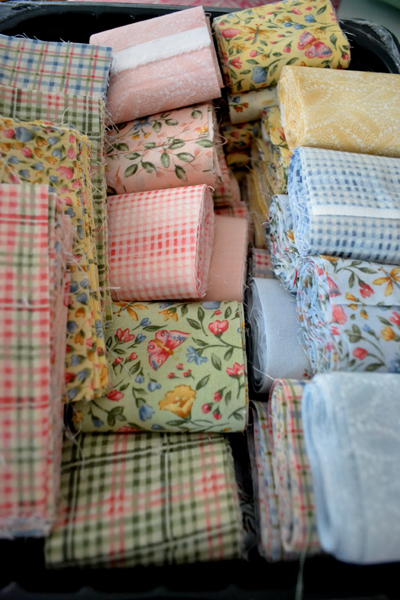 While working on the duvet covers made for last year's Christmas gifts! All of this has taken place with holiday sewing and decorating to boot! 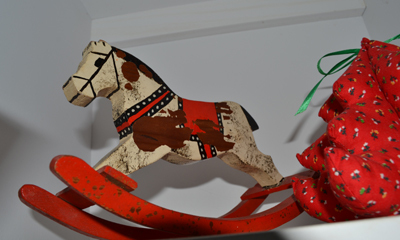 Christmas decorating: My husband's antique toy rocking horse. 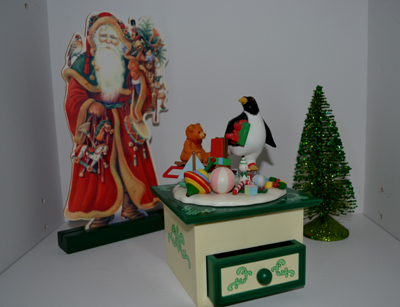 ....and Christmas music boxes given to my kids by their grandmother. 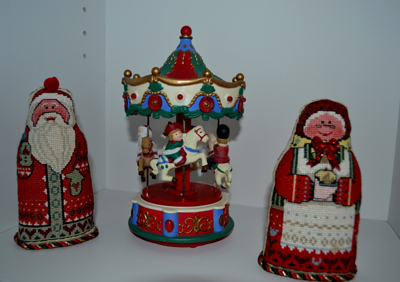 These music boxes come out only at Christmas! 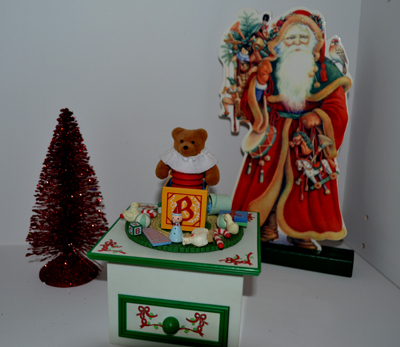 Little cross-stitched Mr. and Mrs. Santa Claus and an Avon music box. 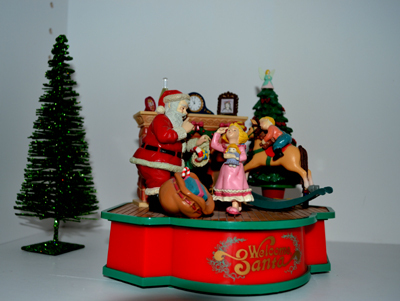 ...and another little holiday music box from my favorite aunt, Aunt Catherine. 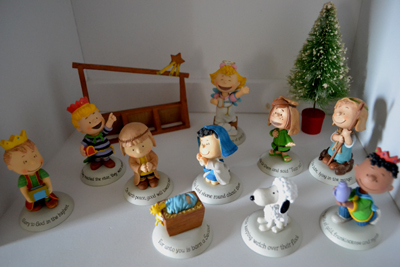 ...and my oldest daughter's latest creche set! 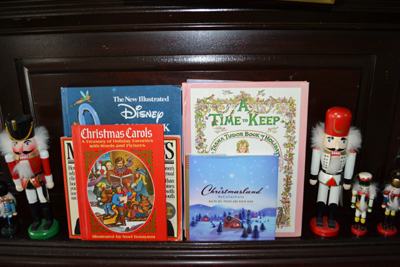 ...and nutcrackers on the piano with Christmas Carols and holiday books. 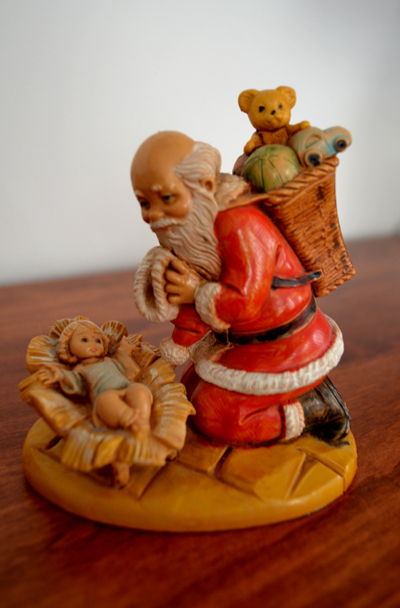 ...and this sums up our style of celebrating...Santa and the Christ child! Many years ago when I was a psychiatric nurse, I learned that denial can serve a useful purpose. It buys the time needed for a person to muster the inner strength and fortitude needed to face what appears to them to be too difficult to face. It might seem to an outsider that instead of working hard to avoid the challenge, it would simply be easier to face their issue and "get on with it". And so it is with me this year regarding the holiday season! Here we are well into the Advent Season, and I have at last decided to quit denying that Christmas is almost here and simply get on with preparing for it! 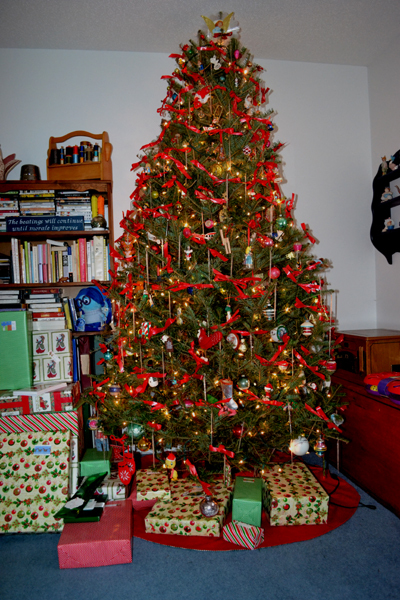 Little House Tradition: a live tree, ornaments, antique balls and red bows. I am realizing that denial seems to be a theme in my life, be it Christmas 2015 or growing old! I am finally realizing the futility of hanging onto my college wardrobe until I lose weight. Mini-skirts at age 69 might not be as cute with varicose veins and long and thinning, mouse-gray hair! I seem to be operating on Standard Jane Time too, denying that the rest of the world is NOT doing the same! 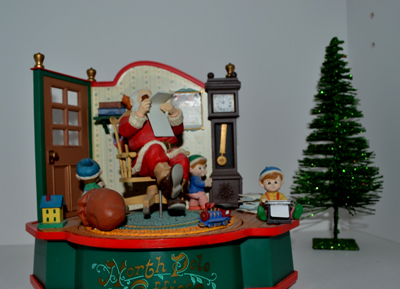 You may NOT be as old as me in years, body or spirit, but I am finding that turning on Christmas music isn't all that is needed to sufficiently energize me as it used to, in order to prepare for what is still my favorite holiday! 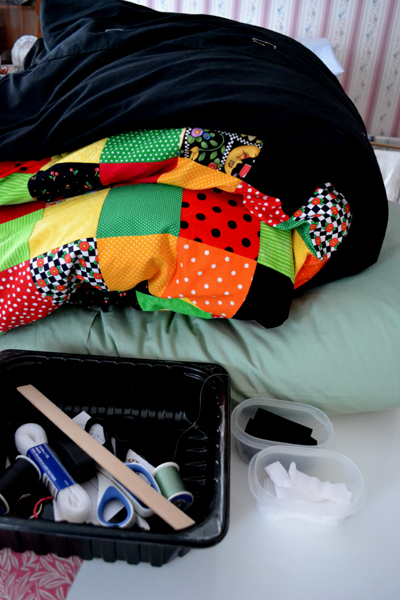 Laugh as you will, I am still finishing the patchwork duvet covers that had only a few day's worth of work left to finish them last year at this same time. I am however proud to say that I haven't given up on completing them this year in time for Christmas, though in Standard Jane time, that will likely be a few days after Christmas?! 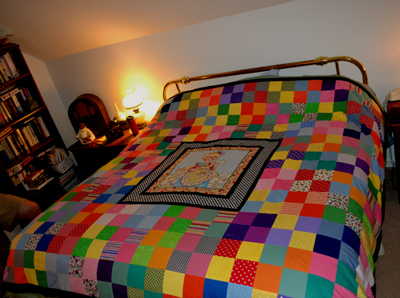 Mary Engelbreit Panel/Patchwork Duvet Cover for first daughter. Backside of second daughter's reversible Mary Engelbreit Panel Duvet Cover. Top of reversible duvet cover. Whoops, forgot to clear the messy dressers! Close up of this Mary Engelbreit Duvet Cover. Jesus is coming soon and as one of my soon-to-be step-grandchildren said, "We hope Jesus has the best birth ever!" Beginnings are good and I am grateful for a fresh new 2016 to start over!! Perhaps a new pair of track shoes under the tree will help me "walk faster and jump higher", or a new thimble or two will help me finish the many projects that I have started, or am I in denial again? 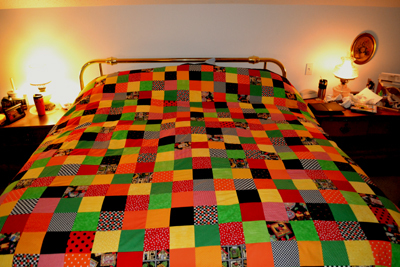 Quilts do take longer to finish than pincushions and fleece socks, and this last year we took over 300 pair of socks to market! I am grateful for our dear Savior's renewable birth in my heart and the chance to finish what I've started, and to start even more creations, and get another run at obtaining good health and fortune! Perhaps, now I will be able to set more realistic goals for 2016 and will add a super girdle and box of hair dye to my Christmas wish-list along with the name of a good hand and machine quilter instead of waiting for my youth to return to finish my bucket list! Now facing another challenge, I am going to attempt to update you on Little House's 2015 year, though our accomplishments seem to all be in the categories of starts, continuances and completions of developmental tasks (no matter how delayed or advanced), as well as participation in therapies. 1) I continue my reading, blog writing and sewing therapies, along with acupuncture therapy as I discontinue the Marshall Protocol treatment for chronic lyme. Am I well-cured? Perhaps like a ham? I have been in this treatment for seven long years! I am not sure if what I have now are remnants of chronic lyme or just the beginning of old age. Now I am looking for that fountain of youth, or should that be a special psychiatric therapy for chronic denial that everything takes longer than it used to?? 2) My oldest daughter and my husband continue to work my craft shows, marketing Little House's wares. This has become a family busy-ness and they are doing a great job! 3) My husband finally reached retirement age and can still work AND start drawing social security. Remember when he was laid off a few years ago, short of retirement? These are not easy times we live in and though retirement isn't as we planned, how fortunate we are that he is still able-bodied and I am still able-minded? That is a fact that will not ask other members of the family to confirm! I think together, my husband and I make a good team?! 4) My oldest daughter emancipates again from home. Her move continues, and Little House breathes a sigh of relief! Guest rooms will soon be available. Reservations must be made in advance...and no, we don't serve breakfasts...but perhaps a brunch instead! 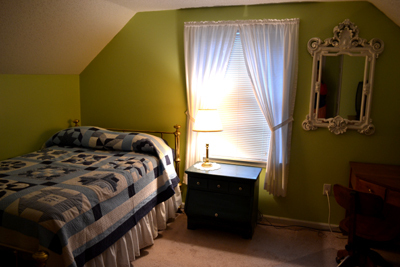 Guest room #1. Still need to paint this bedside table. The rocking chair needs to be repainted too. 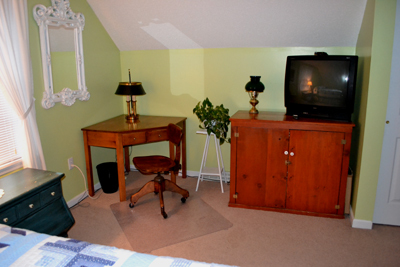 Guests will have their own TV. 5) Our holiday celebrations expand when my oldest daughter starts bringing her new boyfriend and his family home for them! Two additional leaves to our family table are now needed to accommodate four more! 6) My husband and I start trying out new grand-parenting roles with potential step-grandchildren. "Spoiling with no consequences" is our new rule of fun! 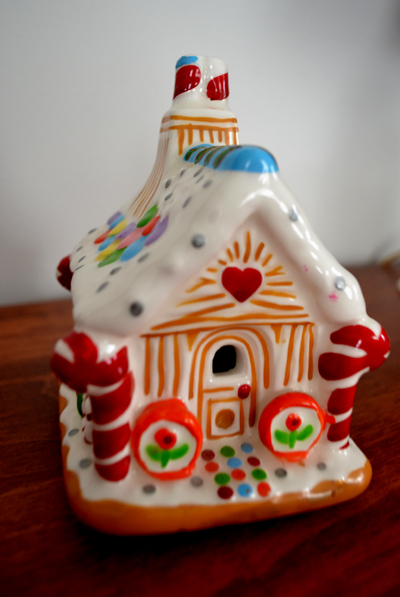 7) My husband and I start to enjoy a new-found freedom of having no children living at home! Whoops, this means we have to start to do our own cooking as well as start to share our oldest daughter with many others now! Adjustments aren't so easy at our age!! 8) We do, however, start smiling as we listen to our daughter's stories as she learns that parenting isn't so easy. "What goes around, comes around" it seems! We seem to be growing smarter despite getting more senile?! 9) Our children are now financially independent! Hooray!! Just in time for them to start supporting us in our old age, OR NOT?? 10) Our youngest daughter continues to bring her laundry home to do, but we are glad or we might not see her so regularly! Now you are as up-to-date as we are!.... "Oh dear, we hope that you are more up-to-date than us!" ...What I mean to say is that you have now been brought up-to-date with Little House's events of 2015...My crazy dreams and schemes keep on going and I will again be sharing them with you in the year ahead! Wishing you all a Merry Christmas/ Happy Hanukkah/ Winter Solstice/ Happy Holiday and may 2016 be filled with many blessings for you and your family!! 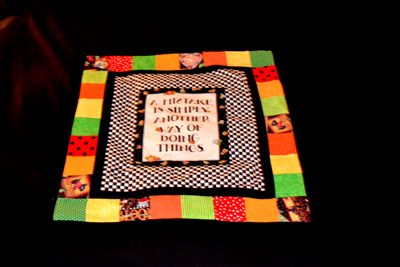 * per Bonnie Hunter, infamous and prolific quilter, a serious quilter always keeps a "Leader-and-Ender Basket" near her sewing machine so in her spare time, another quilt top is suddenly all pieced and ready for quilting! 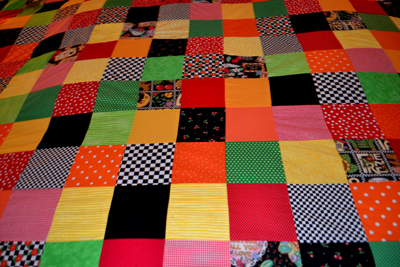 I also keep at least one quilt ready for quilting near my quilting machine as well, hoping that there are little quilting elves, like the shoemaker's elves that "make it happen" in the night while I sleep...denial or a good imagination?? "Certifiable?"